Organisers of Bucks and Milton Keynes’ Armed Forces Day are calling on businesses to sponsor activities on the day, which itself is entirely funded by donations. It is hoped the popular bi-annual event first held back in 2009 will attract more than 10,000 people, and now Bucks Lieutenancy is teaming up with the county council and the Royal British Legion to encourage local businesses to put their hands in their pockets. Lt Col Simon Wilkinson, also deputy lieutenant for Buckinghamshire, said: “This presents a wonderful opportunity for local businesses to offer their goods or services for the benefit of our services personnel and families, or to make hard cash donations to sponsor the attractions. The air show and performance arena will cost £10,000 each, while the stage and the World War One village exhibition will be £7,000 each. For £5,000 businesses can see their company logo on banners, programmes and websites if they sponsor the funfair, picnic area, hospitality marquee and tea tent. Activities such as the zip wire, climbing wall, bungee tramps, coconut climber trees, inflatable laser quest and body zorbing will need between £2,000 to £2,500 of sponsorship so that youngsters can join in the fun on the day. 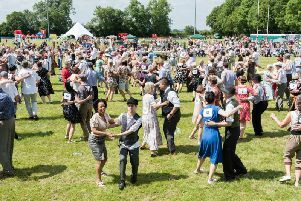 This year, the day will be held at Aylesbury Rugby Club in Weston Turville and needs £65,000 worth of sponsorship to be able to go ahead. The government launched the national Armed Forces Day six years ago to highlight local communities’ support for veterans, serving personnel, their families and cadets. Call 01494 732183 or email bucksccevents@buckscc.gov.uk to discuss sponsorship.